All three of these paintings are by William Craig (1829-1875). Born in Dublin, he spent most of his life in upstate New York, but made a trip to Kentucky in 1865. A site that show some paintings of Maysville scenes, visit the Ohio River Valley Artists Guild, here. A more courageous man never lived. 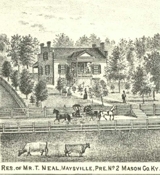 The Rankin House was a Major Station on the Underground Railroad. The Ohio Historical Society's Site on this house is here. The old church was struck by lightening and burned, June 13, 1944; the new building was dedicated on December 7, 1947. 1965 Seddon Church Pew Dedication, which contains a history of the church. That pdf is here. Pyles is an archaeological site of a Newtown village, from the 1499-1000 A.D. period. On a ridge on the North Fork of the Licking, about a mile west of Lewisburg. Over 2,000 items excavated as part of the Curtis Collection from “the Fox farm” in Mason County, are donated to the Kentucky Historical Society; others to the Smithsonian. Murphysville declared dry in 1873. A Lynching in Tollsboro, details here. Times and routes of the various state coach routes in Mason County in 1875 are here. “We learn that John L. Scott has sold his peach crop to a Cincinnati firm for $14,000, the purchaser to gather the fruit, pay all expenses, and take all risks. We learn that the crop is very large and the quality of the fruit good. The orchard contains fifty acres and cost Mr. Scott, some years ago, $4,000. A good profit, certainly.” from the Louisville Daily Journal, July 18, 1867, reprinting an item from the Maysville Eagle. Along the river just above Maysville. Dravo Gravel bought the town in the 60's. Springdale Post Office” above door. 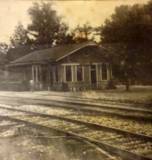 Helena is incorporated as an official town in 1854. Point-Au-View Farm, 1910, is described here. From a Facebook post by Ron Bailey, of a Bob Chamblin picture. 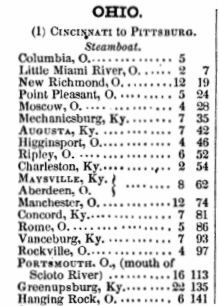 in this steamboat distance chart from 1855's The Western Tourist and Emigrant's Guide. It was where International Paper and the Spurlock Power Plant are today. Here's a description of it from 1795. 1795!! And in this 1804 map, note Charleston and Washington exist; Maysville does not. The Mason County town of Woodville was officially established on March 22, 1851. “Johnson Junction, Ky., March 23.-At Helena, Mason County, the gunshop of John h. Wood and the storehouse of Joseph Patton, with the entire stock of goods and Patton's dwelling, were all burned to-day. The only insurance was $2,000 on Patton's goods. Wood's lass, $3,000; Patton's loss, $5,000.” Cincinnati Enquirer, March 24, 1880 A massive downpour on Bull Creek washes out the C&O, and kills several, here.